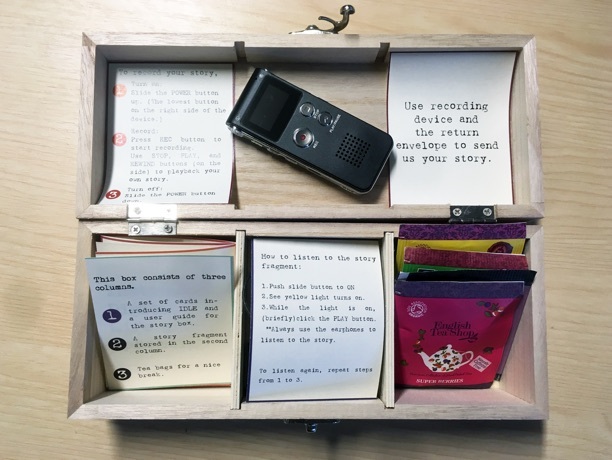 At the department of devices, we have been hard at work creating the Storytelling Box. Only few technical resources survived the solar flare. Among those was a single voice recorder, which happened to be stored in our document vault, shielded from the flare. This recorder contained the only surviving story fragment from our previous archive. To enable the recording of new stories and to start building up our archive once more, the Storytelling Boxes are being sent to you storytellers across the world. The boxes contain a simple playback device made by the department of devices from available analogue parts and these can only hold one story. We have put the last remaining story from our archive on and hope that you will get inspired by this, telling your story. Please use the black voice recorder to record your story and send it back to us in the envelope provided (please treat this very carefully, there is only one such recording device left). We will publish your story here on this web site, once we have received it.